Well, please advise if I do something wrong, as I'm new to this. I'm yet to put up my Camelot photos! The former Maternity Hospital, now closed. Opened in 1968, Billinge Maternity Hospital served as the maternity facility for the surrounding areas, including much of the Metropolitan Borough of Wigan, parts of the Metropolitan Borough of St.Helens and parts of the District of West Lancashire . In June 2004, the maternity hospital was closed and maternity facilities were transferred to other units at hospitals in surrounding districts. 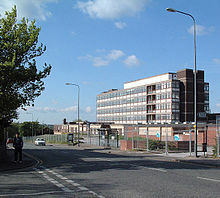 leigh and St. Helens who administered at Billinge Maternity Hospital, were transferred to a new maternity unit at the royal Albert infirmary (more commonly known as Wigan Infirmary) in Wigan.Maternity care units were upgraded in surrounding boroughs at Bolton Hospital, Salford Royal, Chorley Hospital, Warrington Hospital and Ormskirk Hospital. In March 2007, demolition work on the maternity hospital building commenced. As of May 2007, only a small section of the maternity unit is left standing. In April 2010, only two buildings stand which are due to be demolished soon as more houses are being built on the site of the former hospital. This place is quite battered and unsafe, but up on arriving, was very shocked on how easy the access was. Still has a few "hospital" bits in, including an old bed, which I couldn't quite get to as the floor decided to go through!! We kept hearin lots of creepy noises, so we only stopped around an hour, but there's a lot to see although it is basically falling down. We also came across a dead dog in one of the rooms on the top floor, or could have been a fox, was just all bones! Anyway, no security, although there's a security shed out the back of the building now, but no sight of anyone. If anyone does visit please be careful as it is quite dangerous! Sorry for the photos I'm in the middle of trying to purchase a professional camera for my new hobby! !